Tiny brains in a big laboratory. When former developers of Assassin's Creed, Army of Two and Dead Space get together to make a game, what sort of experience might you expect? 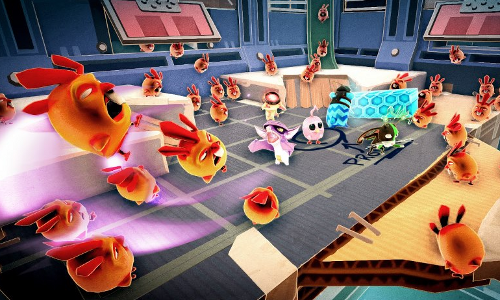 Probably not a co-op puzzle game where you play as tiny little creatures being subjected to the experiments of a mad scientist. That's exactly what the upcoming Tiny Brains will be, however, and even if it wasn't the first thing on your mind, it still looks like an interesting release. Spearhead Games wanted to make something innovative as well as "super fun and truly cooperative" with Tiny Brains. The trailer shows a lot of cute characters and has an almost Pinky and the Brain vibe to it. The release platforms are still being finalized, though the team emphasizes this isn't a mobile game, it's more of a PC/console kind of thing. Page created in 0.5286 seconds.